This digital tabletop drum kit is developed to resemble, sound and play like an actual drum set at a fraction of the size! This customizable, lightweight and portable instrument kit gives today's modern technology and look over the traditional and bulky drum sets. Play the drums to prerecorded drum kits and songs --like soft rock, hard rock, electronic, pop, jazz and much more-- or record your own! The top panel control center comes equipped with LCD screen and a ton of audio configuration controls that will allow to create some truly unique and customizable music. Once you've setup your sounds for the drum pads, you can save the presets and continue to drum from there. Then, when you're ready, hit the record button and create your first drum solo! This digital drum kit is powered by the included AC adaptor or you can go wireless and runs on batteries (6 "C" size batteries). Take your drum kit wherever you go! Pump up the volume and drum for a crowd of family and friends or take advantage of the headphone jack and plug in your headphones for a personal drumming session. Other inputs include kick and hi-hat pedal input jacks along with a USB jack to connect external devices. You can connect this unit to your computer using the USB cable – it’ll function as a MIDI controller for your favorite computer software to get even more functionality! DC 12V adaptor, pair of drumsticks and 2 footpedals (kick and hi-hat) (laptop not included). Dimensions:(L x W x H) 500mm x 370mm x 157mm - 19.6" x 14.5" x 6.1"
Review : pedals both broke.. need new ones..
Review : So far so good. Kids love it and it has all the features advertised. Review : These desktop drums are great! they are easy to use and connect to your desktop computer to work with your DAW! Review : Excellent sensitivity and very affordable/compact. I've had mine for about 6 months now. Still very impressed/happy with it! Review : I received the PTED01 Portable Digital Drum as a gift because I really wanted to learn how to play the drums, but I live in an environment where an acoustic kit would be too loud. This product does everything I would want it to do as a beginner drummer, and I was over all very impressed with it. The response time is great, no lag when you hit the pads. The drums are very dynamic too, which I was not expecting. I love that in addition to the preset kits you can also create your own kit, making it very flexible to get the sounds you want. It does take some getting used to, definitely not like playing an acoustic kit, but such is the case with almost every electronic drum set. This product works great as a midi controller, though there is no way to turn the sounds off on the drums if you are trying to hear sounds from your Sound Engine (which this device does not have the ability to act as through your DAW), so you'll have to turn the volume all the way down on the Digital Drum itself in order to only hear the sound coming from your DAW. It also does not come with a cord to connect to your computer to be used as a controller, but if you have ever bought a midi controller in the past, chances are you will already have the needed connection. Overall a very easy and simple product, not too advance but it is great for beginners. 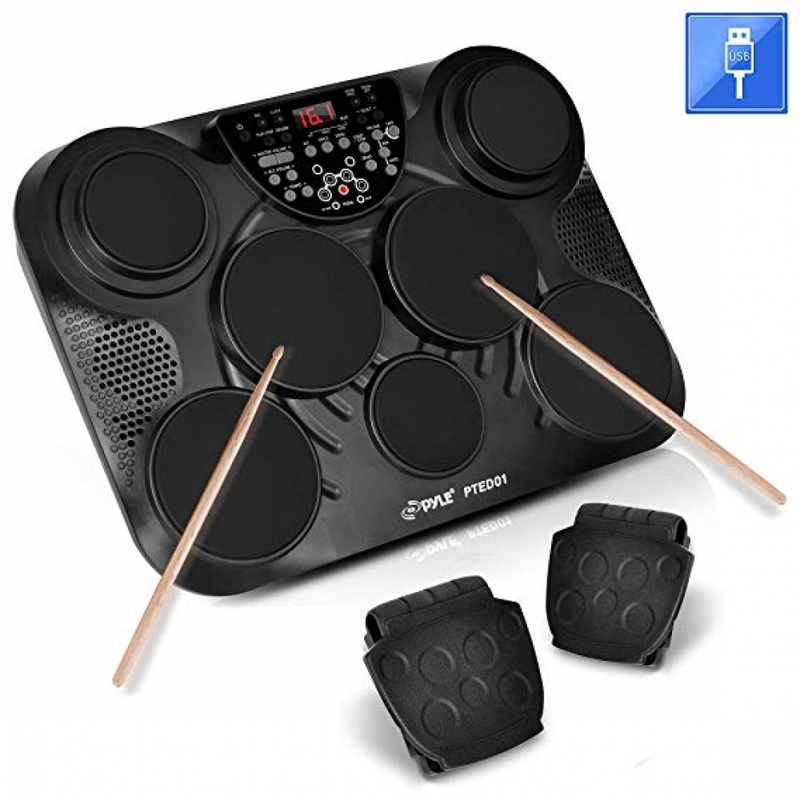 Review : We bought the PTED01Portable Digital Drum for our son for his 13th Birthday. It is a hit! His older brother (26) can't wait to get his hands on it to play it! Speedy delivery and wonderful product! We are very pleased! Review : Was very impressed with this machine. Review : I bought this for my 10 yr old son for christmas.He loves it, wants drum lessons now. Review : I can't find the review I posted so not sure if this registration will work or not. Please simplify the process. Review : I was looking for a nice, fairly inexpensive practice set that I could take with me on the road. I've been very pleased with the responsiveness, the pad feel and all the pad/set options. I only with it went just a hair louder, but that's a rock drummer for you. I'd recommend this for beginners or those that want a nice compact practice set. Review : This bad boy is not a toy for 8 year olds, this could very well back a real band if needed. I have been playing every instrument I can afford since I was 8, and this is top notch sound sampling of a drum jit. I can only dream of what a real digital drum kit from pyle sounds like. Bad assed I'm sure. Review : I own an Acoustic drum set and a Rockband Ion Electric Drum set. I was looking for something a little more portable & something that I could connect to my PC for recording/messing around with other programs. PRO'S: 1.It's very lightweight and could easily fit in a backpack along with the included power cable & 2 pedals. 2. Comes with 2 Foot Pedals 3.The Pedal inputs are AMP cable plugs, so you can use higher end electric drum pedals on this kit. 3.Lots of drum voices to pick from. 4.Pads seem durable and built to last. 5.Can be ran on 6 C Batteries instead of power cable. 6.Using this as a MIDI controller really brings this drum set to life! CONS: 1.The Pedals it come with aren't the best. 2.The Pads need to be hit in a specific spot for best results, sometimes it may drop a beat at times. Review : My 8 year old loves it, he got it for Christmas. Review : Would recommend it. Everything works great. Only bad part is sometimes the pedals double taps by itself and the edges of the pads do not work the same way as when you strike the middle. Review : First time attempt at drumming and the set is easy to set up. Sounds great to me. Well labelled, a little tough to figure out the setting at first from the directions but once you get it figured out it is fine. Everything well laid out and looks like it will be fun. Review : Working as advertised. Installs under Windows 7 as "Medeli e-organ" and not working properly with Sony Acid 7 as a drum MIDI controller. Do not know enough to assign blame. No useful information on this problem found on Pyle web site, or Sony's Acid web site or by Google elsewhere. Disappointed that Pyle does not recommend a compatible music sequencer/recording program or a driver for Windows 7.
Review : My son is only a toddler, but he is obsessed with music, especially drums. We have been trying to slowly introduce him to real instruments, instead of "kids" music toys as he has been growing up. For Christmas, we wanted to get him a drum kit to replace his 5-gallon bucket drums, but were concerned that it would be too loud as he is learning to play. We bought this unit based on the great reviews, its small footprint, the logical pad layout, its foot pedals, and its ability to control the volume. He has only had it a few days, but he loves it...and I have to admit, I love it too! This drum kit sounds amazingly real and the speakers are clear enough to fool the ear if you were to listen from another room. We set it up on a small coffee table, and he has already pulled up his chair there as permanent fixture in our home! He loves to reach up to the dial to switch up the drum kits to get different sounds, and I love how simple it is to control the volume of his play. The pads are sensitive enough to respond to his little hands in the hand percussion mode, and the plastic seems durable enough to withstand his not-so-perfect aim with the drum sticks (I will update this review if we start to see any major damage in the upcoming months). We are learning to play together and we could not be happier with the purchase. Review : Great product, good sound. Review : I would say only improvement I could see,would be to have an actual MIDI port on it,for system compatibility sake, not just USB only,other than that I like it a lot.